Let’s get down to it. Mealtimes are fun, but boy, can they be messy. Think stained tops and a whole lot of washing! But, if you find the right bib for the feeding stage they're at, then the mess can be contained - we promise. The trick is making sure that during those messy phases you’ve got as much of them covered as possible. They may not be on the solid stuff yet, but that doesn’t mean that they can’t be messy - baby milk drool anyone? That's where a muslin comes into play. Not only are they burp cloths, blankets and swaddles but they can be used as bibs and teethers too. Pick one that's made of soft organic cotton so it won't irritate delicate skin and is soft on those sore gums. We love these Etta Loves Sensory Muslins - 3 Pack, which are super soft and feature sensory patterns for baby's development too. #Doubleduty. 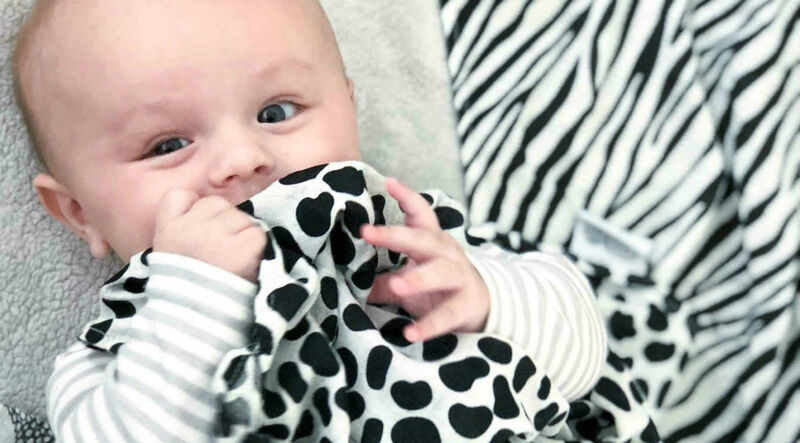 Etta Loves Sensory Muslins - 3 Pack, £24. This is where mealtimes get interesting. It’s time to wean. And you’re going to need a bib that’s tough enough to withstand the food mess, while keeping them comfy at the same time. So pick a bib that’s right size for their age group. It means it won’t feel heavy and hang off if it’s too big, or be tight and irritate them if it’s too small. And, let’s face it. They’ll be more likely to eat if they’re not worrying about what’s around their neck. Baby Led Weaning? A bib with a crumb catcher is a must for when they (inevitably) drop that finger food. Not only will it save your floor, but as they get older (around the 8 month stage) you’ll find they’ll be picking food out of the little pouch. Waste not. Want not. This Bibetta Ultra Bib is made of waterproof neoprene making it durable, waterproof and easy to clean. With a velcro fastening, it can also be adjusted to comfortably fit around their neck. Puree feeding? It’s time to get them covered. Because even if you’re feeding them, there’s always the inevitable flinging the spoon out of your hand tactics. And the little food dribbles if they take too much in. *Sigh. This Bumkins Sleeved Bib is made from a lightweight waterproof material, which is light around your baby’s neck. It fit my little girl (that’s her in the pic) perfectly from 6 months and thanks to the tie fastening, it kept her mess free. The elasticated sleeves also mean that there’s less chance of loose material being dragged through their food. And, I love how we can wash it under the tap and it dries in time for the next feed. Winning. Got a super messy eater? No problem. 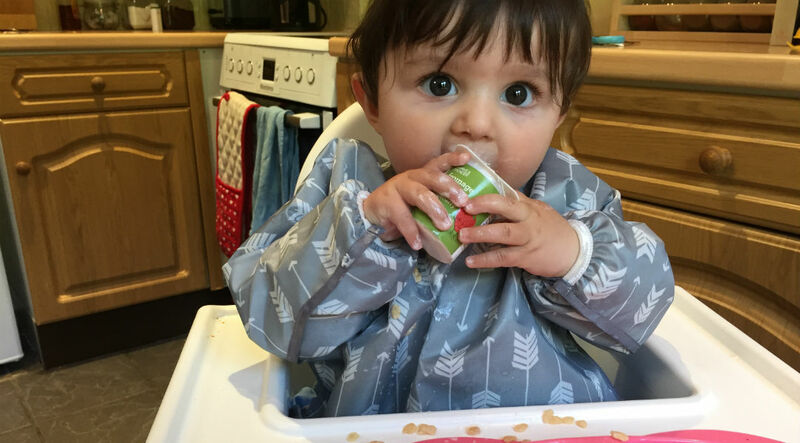 This Tidy Tot Bib and Tray Kit was coined by a mum who had lived through messy weaning. 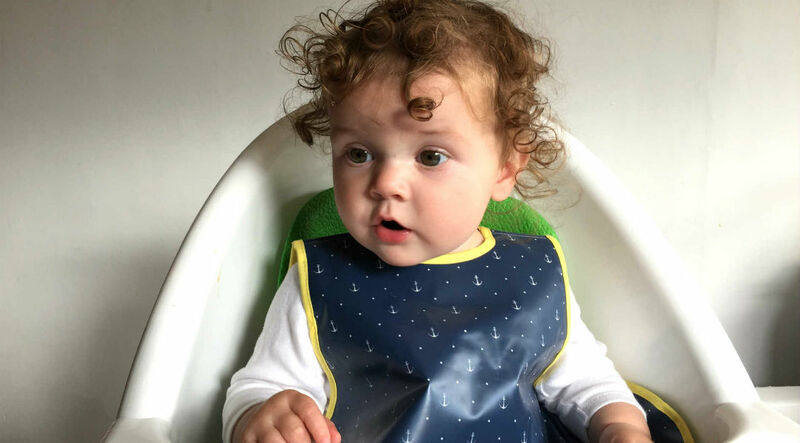 Designed to cover all of your messy eater and the gap between them and their tray, this waterproof bib fastens around your baby’s neck and attaches to their chair with velcro. It means food stays above ground. Boom.